A red dot sight incorporates a circle that aligns with the target. The market is flooded with a number of red dot sights and deciding on the perfect one is quite a daunting task. Bear in mind that these are designed for close-shooting or quick shooting situations. So, if you’re looking for a scope that will help you with distant targets then red dot sights aren’t for you as most of these don’t magnify the target, 1x magnification at best. Vortex Optics is a well-trusted name when it comes about optical equipment and the SPARC AR is one of their finest creations. 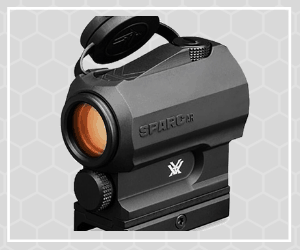 The Vortex SPARC is a compact yet durable red dot sight that is designed for the people who are looking for a high-quality scope without breaking the bank. If you want a superior red dot for close range shooting, then the Vortex SPARC is your guy. It’s suitable for both beginners as well as professionals and its brilliant precision also makes it a perfect fit for the law enforcement and military. When it comes about design, the SPARC is quite a stunner. It’s lightweight, compact and offers great durability. It can be used on a wide variety of firearms which gives you the flexibility to equip it in your preferred one. The body of the Vortex SPARC is made with aircraft-grade aluminum that is water-proof, shock-proof and fog-proof. The body is wrapped in a high-quality rubber that can handle any extreme condition like a champ. It comes with a plastic lens cap that protects the lens from external damages. There’s a waterproof compartment that holds the AAA battery. The control settings are on the left side of the lens and there are two easily accessible buttons that cycle the eight red dot intensities, turn on and off options, and two IR levels. The Vortex SPARC is equipped with 2 MOA daylight bright red dot that offers excellent precision in all lighting conditions. It spots the target quickly and efficiently regardless of the background setting. It also comes with night-mode which will come in handy for the nocturnal hunters. The 2 MOA dot is perfect for close range targets. However, if you’re opting for a long-range target more than 300yards away, then the 2 MOA wouldn’t suffice. It comes with 1x zoom and you can also adjust the brightness according to your liking. The SPARC red dot sight uses an AAA battery that comes along the box. The battery is secured under a water-proof box under the front glass. Considering the price, the SPARC offers an outstanding battery life. It offers 300 hours of backup with full brightness and it can last up to a whopping 5000 hours on the lowest setting. However, it automatically shut down after 12 hours of continuously used to prevent battery rundown. The build quality of this red dot sights is top-notch. It’s super lightweight weighing only about 7 ounces. It’s waterproof, fog-proof as well as shock-proof and it can withstand a temperature range from -40 to +160 degrees Fahrenheit. The aircraft grade aluminum enables it to endure extreme condition. Even though the SPARC comes with such a budget-friendly price-tag, it includes several accessories to make your experience smoother. It comes with two low height mounting options, rubber lens cover strap, one AAA battery that will last you a million years(metaphorically) and a 1x magnifier. Vortex offers no question asked warranty. You’ll get a full refund or they’ll send a new one if the product gets damaged somehow. Quite a steal, right? However, bear in mind that you will not get any refund or replacement if the product is damaged because of misuse or abuse. The Vortex SPARC has ten variable illumination settings which enable you to choose a setting that’s suitable with the background and surrounding condition. The lowest two settings are night-vision compatible. Vortex also recommends keeping both eyes open to get better use of the peripheral vision. It’ll help you get to your target more easily and quickly. There are two separate buttons that enable you to adjust the brightness setting quickly. The SPARC red dot performs the elevation and windage through audible clicks. Every click will shift the point-of-impact one MOA. On the other hand, the SPARC enables you to mount it two height settings. To mount it in the lower 1/3 co-witness, the mounted sight should be 40mm above the center surface. To mount this to absolute co-witness, you need to remove the 3mm base shim and the optic center should be 37mm above the base surface. The Vortex SPARC is an incredible red dot sight that offers great value for money. It’s a versatile scope compatible with AR-15s, AR-22s, shotguns and even pistols. It enables you to have a clear look at the target and the adjustment setting makes it a great fit for both the beginners and the skilled shooter. There is a pool of good red dot sights available out there but the Vortex SPARC will provide you with excellent service even under vigorous conditions and it’ll surely be one hell of a great investment! What type of battery does the Vortex SPARC use? Ans: The SPARC uses a CR123A battery. Ans: The SPARC is made in China.